Welcome to Glacier Gardens, a uniquely designed rainforest botanical garden nestled in the midst of the Tongass National Forest. On your guided tour you will learn about the exquisitely landscaped botanical gardens, the reclaimed stream cascading close by, and the innovative garden designs the "Flower Towers" all while indulging in the area’s immense history and rare temperate rainforest habitat. Travel by covered rainforest shuttles through Alaska’s natural wonderland. Your guide will describe points of interest along the 2-mile long path up Thunder Mountain where a cliff-side boardwalk leads to a phenomenal panoramic view of Juneau. Open May 7 - September 23, and not available for winter off-season visits. 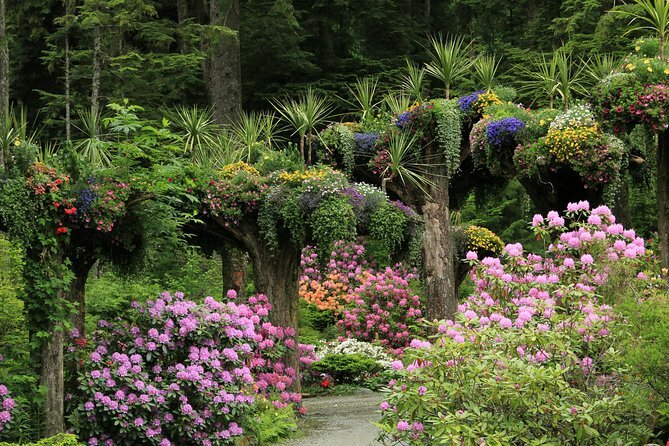 A botanical Garden with a guided tour through the Tongass Forest, to a beautiful over look. Operates: Daily, May 15 - September 15 9 a.m. - 6 p.m. (schedule based on cruise ships arrival in Juneau outside of these dates), with last guided tour leaving into the forest at 5:30 p.m.
Departure Time: Daily, 9am - 6pm. Please specify your expected arrival time during booking. Located 7 miles form downtown Juneau and 1.5 miles for the Juneau International Airport. We are centrally located in Juneau on Old Glacier Hwy, near the Fred Meyers shopping center.